WHEN YOU WERE A LITTLE GIRL, DID YOU WANT TO BE A FIREFIGHTER?? A lot of little girls do, these days. But if you answered "NO", it's no surprise. Most women firefighters would give you the same answer. Face it: little girls in the 1950's and 1970's weren't brought up with many career options. And even if we were drawn by the excitement of those bright red fire trucks we weren't given an idea that we could expect to become firefighters ourselves when we grew up. BUT THE FACT IS THAT THERE ARE NOW THOUSANDS OF WOMEN IN THE U.S. WHO MAKE THEIR LIVINGS AS PROFESSIONAL FIREFIGHTERS. IN THE LAST TWENTY YEARS, FIREFIGHTING HAS BECOME A NEW AND EXCITING CAREER OPTION FOR MANY WOMEN. IN BOSTON, THERE ARE NOW 18 WOMEN FIREFIGHTERS AND THE CITY IS AGGRESSIVELY RECRUITING FOR MORE. Women choose careers in firefighting for a number of reasons. For many, it's because they want a job that makes a difference. Firefighting can be an exciting and highly rewarding career, firefighting isn't just mindless brute strength. It involves the special challenge of putting one's skills to the test in an emergency, of calling on all of one's resources of mind and body to help resolve a crisis. THE JOB IS ATTRACTIVE FOR MANY REASONS, FROM GOOD PAY AND BENEFITS, PROMOTION INCENTIVES TO THE OPPORTUNITY FOR A RICH AND REWARDING CAREER. IT IS USUALLY THE THRILL OF FIREFIGHTING THAT WOMEN AS WELL AS MEN LOVE MOST ABOUT THE JOB. The fire service isn't just about fighting fires. Other opportunities are available such as: becoming a fire inspector, safety educator, emergency dispatcher, or arson investigator. Women can and do serve in many of these roles enjoying their work and performing well. After all, women have been in the fire service for over a hundred years. The first female firefighter on record was an African American woman named Molly Williams. Held under slavery by a member of Oceanus Engine company #11 in New York City. Known for her calico dress and checkered apron, she was said to be "as good fire laddie as many of the boys." Molly is most remembered for her courage and strength during the blizzard of 1818. Male firefighters were scarce due to an out break of influenza, a major fire broke out during the storm, Molly took a place with the men on the dragropes and pulled the pumper to the fire through the deep snow to the fire. 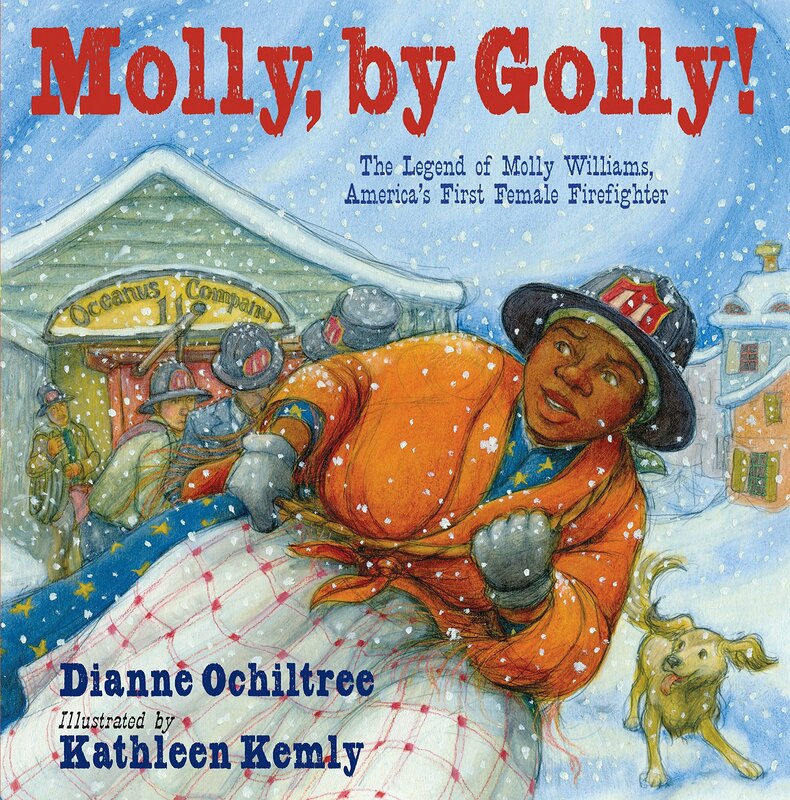 Her story has been made into a children's book "Molly, By Golly!" available here. PERSONAL QUALITIES: Many women fail to hold, gain respect, or advance to better positions due to the absence of personal qualities. People gain their first impressions: and on the basis of it, they frequently judge the individual before he/she has an opportunity to speak. A woman should endeavor to select clothes that are becoming and that, at the same time, will be serviceable, sensible and appropriate for the work place. One should look well, and yet avoid extremes. In order for women to survive in the male dominated work place, one must have self confidence and an ability to adapt one's self to changing situations and positions. Personality really a blend of many factors such as co-operatives and tact, voice and speech, social attitudes, initiative and manners. Have a voice that posses a command of the fundamentals of English and develop a reasonably large vocabulary. Unnecessary loudness of voice is offensive. Weakness of voice is almost as bad. Have a sense of humor, refrain from gossiping and be careful who you discuss secrets and your personal business with. Remember "Telephone, Telegraph, Tell-a-Firefighter." Do a little more than might be considered enough to fulfill the basic work/duties requirements. Never worry about what someone is, or is not doing. Harassing statements that are made to you. Warn that if such actions continue, proper channels will be followed to fill a complaint. If possible follow the chain of command to file a complaint first, if no avail then go directly to the Commissioner, Personnel Office, or other mechanisms in place. Finally file a suit through the courts as a last resort. Education: Get all the training you can and more. Learn to listen at what's going on around you and what is happening to other people on the job. Be willing to learn and "don’t know it all." Work at eating, exercising and relaxing in a positive way. Get involved in community services, work events and other activities that promote team spirit. PERSONAL QUALITIES:11:30 AM 09/16/2008 Many women fail to hold, gain respect, or advance to better positions due to the absence of personal qualities.